From left, Kimberley and Naseebah, Esther and Raffeah, and Robin and Kass. The pure Crabbet mare Aurora Raffeah was joined by two more Silver Omen progeny, Aurora Naseebah and Aurora Kassanova. The trio enjoyed perfect riding conditions and beautiful blue skies over the track, a mix of beach, roadsides, farmland, and forest tracks. Kass surveys the scene at the ride base. Kass and Naseebah before the start. 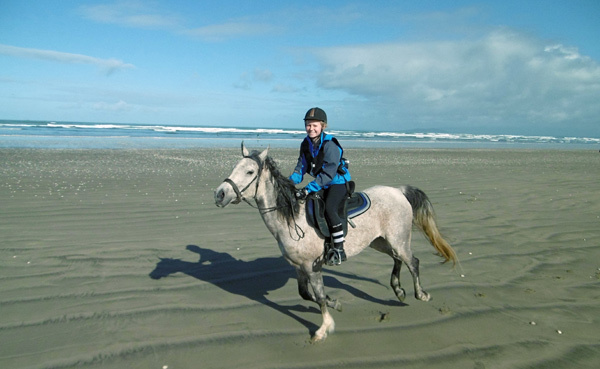 Aurora Naseebah finishing her first ride of the season, October 2015. 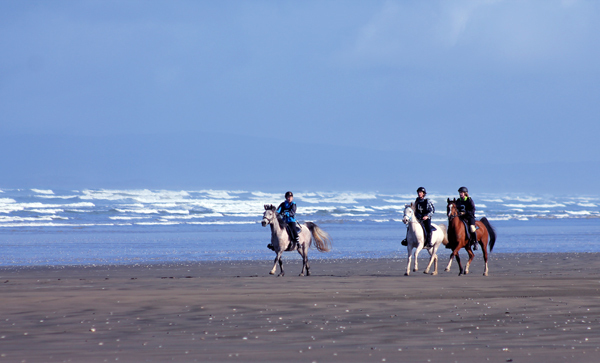 It isn’t easy getting a camera out and taking a photo while you’re cantering, but this picture of Aurora Naseebah and Kimberley running along Oreti Beach proves it can be done!